An example showing the Julia set displayed as a z-warped surface. The Julia set is a fractal (see http://en.wikipedia.org/wiki/Julia_set ). 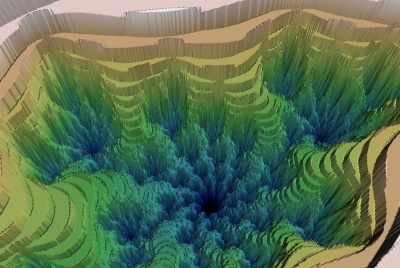 We display it here in a canyon-like view using mlab’s surf function: mayavi.mlab.surf(). # A view into the "Canyon"